The Scubapro Mini Dry snorkel is made for kids. It’s sized slightly smaller than a normal snorkel making it lighter and more comfortable to wear. A patented dry-top prevents water getting into the snorkel even when submerged so you never get a mouthful of water again! The splash guard at the top inhibits water splashing into the snorkel when swimming at the surface. When the snorkel is submerged a float system raises sealing the tube and preventing water entering the system. When you come back the surface the float raises allowing air back in. Below the mouthpiece an auto-drain purge valve. As you breathe this valve expels any water that manages to slip into the system. Zero effort required. A quick clip lets you attach and detach the snorkel from your mask at a moments notice. Splash Guard - A Splash guard at the top of Snorkel stops water splashing into the snorkel as you swim at the surface. 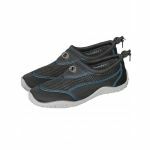 Dry Top Design - Scubapro’s patented dry-top design keeps water out when submerged. As you descend a float raises up in the Snorkel tube sealing the system from water. When you come back to the surface the float raises, letting air in. Purge Valve - A purge valve is built into the bottom of the snorkel which efficiently expels any water in the system as you exhale. Comfortable Mouthpiece - Soft silicone ensures the mouthpiece is comfortable to wear, even during full days of snorkeling. Who is the Scubapro Mini Dry Snorkel for? The Mini Dry Snorkel is a feature packed, high-quality snorkel that kids will love. The modern dry-top design will provide much more enjoyment that a basic J-Snorkel. It’s fun and easy-to-use ensuring they don’t get a mouthful of water spoiling their fun every time they go in the water. 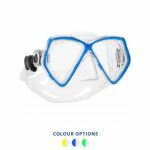 Available in a host of colours its easy to match with their kit, so it looks great when snorkelling.